I’ll Be Back…: For the Collard Greens! 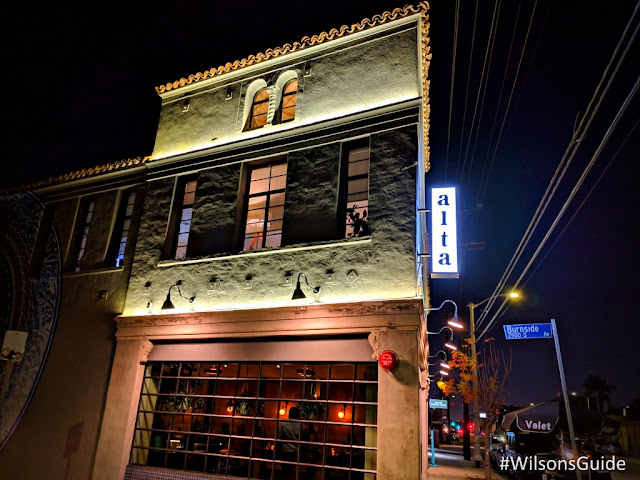 Alta Adams may have only been open for six months, but it’s already caught Los Angeles by storm. My sorority sister excitedly declared I had to check out this brand new restaurant. The bae, who always has a pulse on the latest and greatest, planned a surprise visit here. And girlfriends who have quite the high standards on restaurants gave me the ultimate praise after I suggested dinner and drinks here: “Job well done,” they coolly proclaimed. What Alta Adams has done so well is that it’s brought a hip, high-end dining experience into an area that historically hasn’t this type of establishment for quite some time. With Delicious Pizza opening in 2015 nearby and construction for Cumulus off Jefferson Blvd. underway, I’m sure we’ll see another wave of upscale restaurants, but for the time being, there are only a handful — now including Alta Adams. In the meantime, the neighborhood has seemed to wholly embrace Alta Adams, its often-packed patio, bar and dining areas a testament to its popularity. Personally, I love the vibes, which feel more New York than West Coast to me. Black walls and various shades of wooden browns and tans enwrap the space. Pillows adorned in colorful African prints elegantly grace benches. Photos of foodstuffs like vegetables and nuts, and black people proudly wearing funky hairstyles grace the walls. It feels so warm, so earthy and a lot like someone’s decked out Afro-centric home rather than a restaurant. 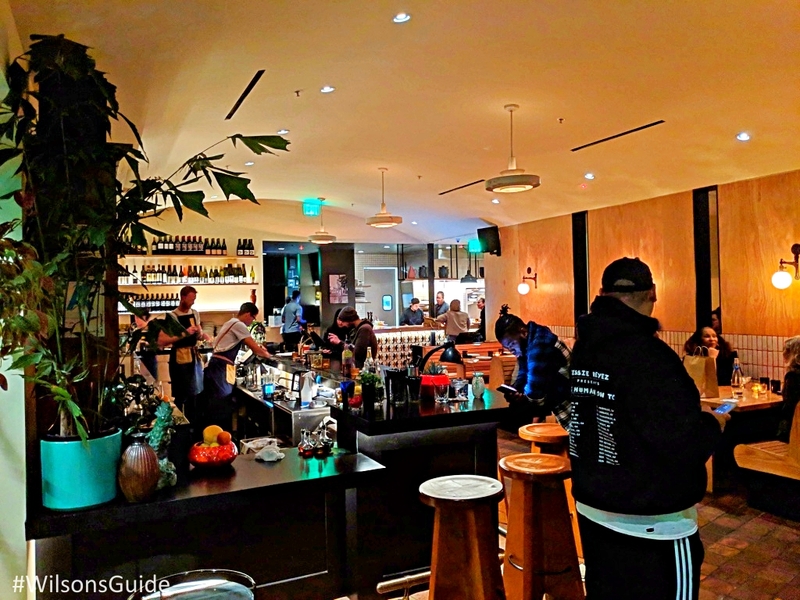 According to the website, Alta Adams brings a “distinct interpretation of soul food that draws the connection between traditional West African food and California cuisine.” From my perspective, it feels like Alta Adams is experimenting with a ritzy, boughie rendition of soul food. What you’ll find here is probably not what you’ll find at your uncle’s backyard cookout…unless of course, your uncle just so happens to be a renowned chef. My point is, don’t expect traditional soul food; instead, be prepared for more of a creative take on soul food. 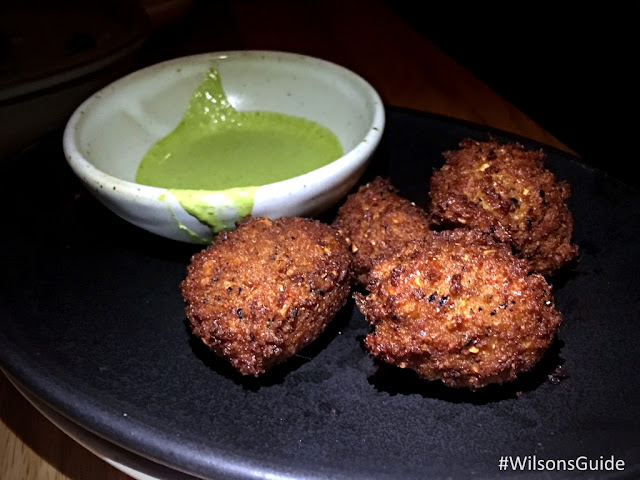 The Black eye pea fritters aren’t how you’d typically find black-eyed peas traditionally cooked in many soul food recipes, i.e., accompanied by rice and infused with meats like ham hocks. Instead, these fritters comprise mashed black-eyed peas encased in batter and fried to a golden brown. They’re great to share, quite filling and vegetarian friendly, too. 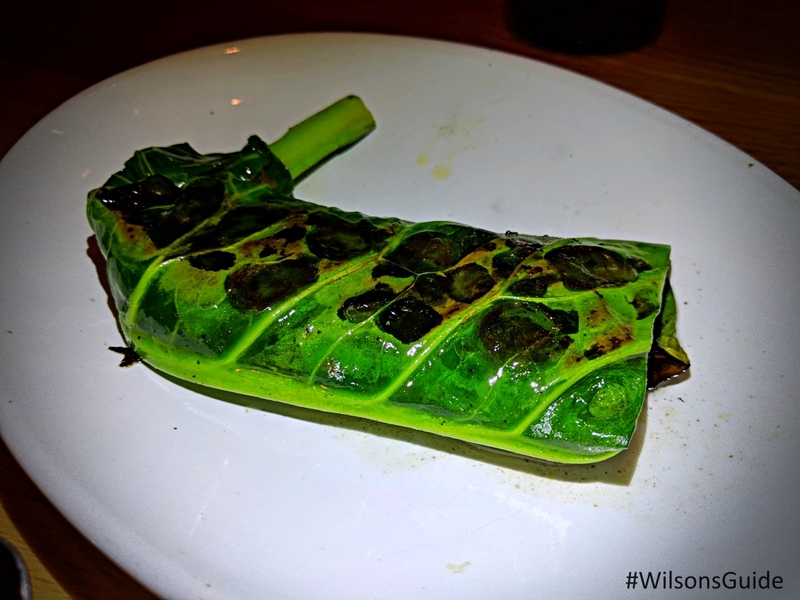 The first time my friends saw the Collard Greens with vinegar and smoked oil, we were confused. We looked at each other like “what in the world is this? !” While these greens may very well not look like any collard greens you may be used to, they are truly special in their own right. Tightly wrapped together, they’re tender and bursting with tangy, rich flavors. 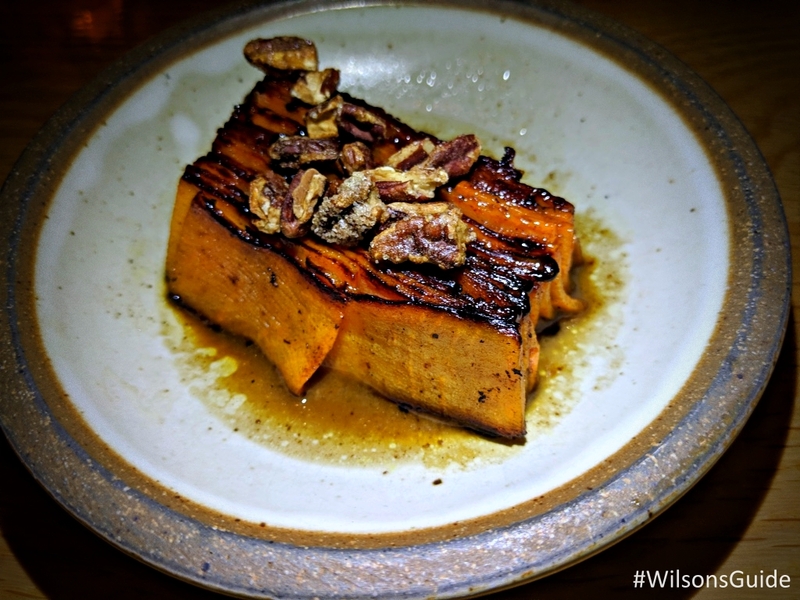 A unique take on traditional yams, the Candied yam gratin with spiced cashews are thinly sliced and all kinds of delicious sweetness, complemented by a smoky flavor from the charred edges. The crunchy cashews add a nice balance between sweet and savory. If I could change anything, I’d definitely make the portion larger; it feels like it’s gone in literally two bites! The Grilled bone-in pork chop with chow chow hands down is my favorite from Alta Adams so far. 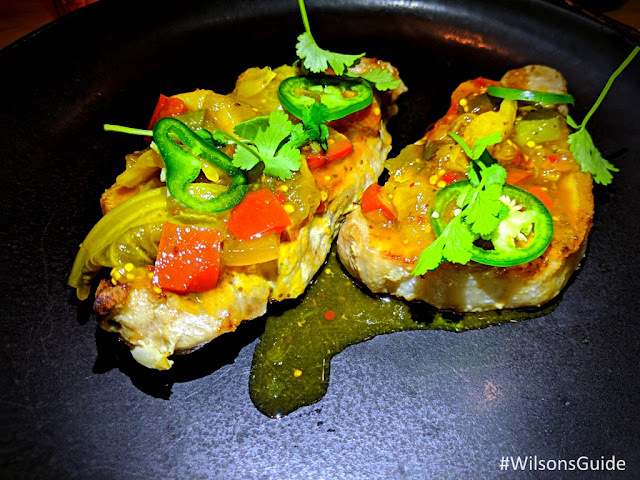 The pork chop itself is perfectly tender and juicy, and oozing with all sorts of incredible spices. The chow chow, a blend of various peppers, onions, fresh herbs and spices, kicks it up a notch, as a simultaneously sweet and tangy topping. And of course, we can’t forget about the cocktails. I’ve only enjoyed one drink — the Bikini Bottom so far (pictured below), because I seriously love it so much that I can’t seem to order anything else. It’s another item that has a sweet-and-spicy aura, fusing pineapple and agave with cilantro and fresno chile, and not only tequila, but mescal. And lucky for you, I’ll actually have more to say about Alta Adams’ libations, as next week, I’ll share my interview with Head Bartender AJ Goodrich when we connected over the newest Spring Cocktail menu. So the next time you’re looking for an elevated soul food experience, in a vibrant setting, head over to Alta Adams. 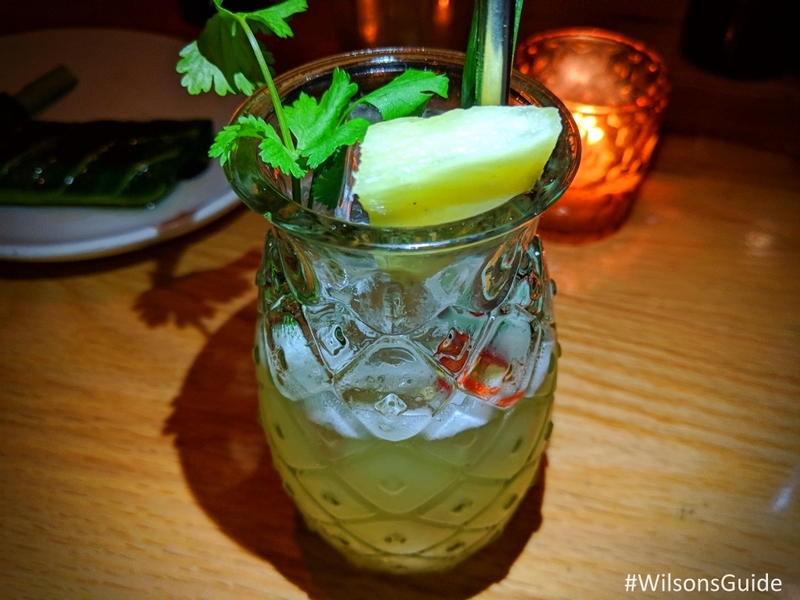 See you there soon and come back to the #WilsonsGuide blog next week for more on Alta Adams’ new spring cocktails!